Imagine the power of your whole company making music together! Music has the power to transform, inspire, move and motivate us both as individuals and groups. This is because we all strongly identify to music. It is a shaping force in our world. 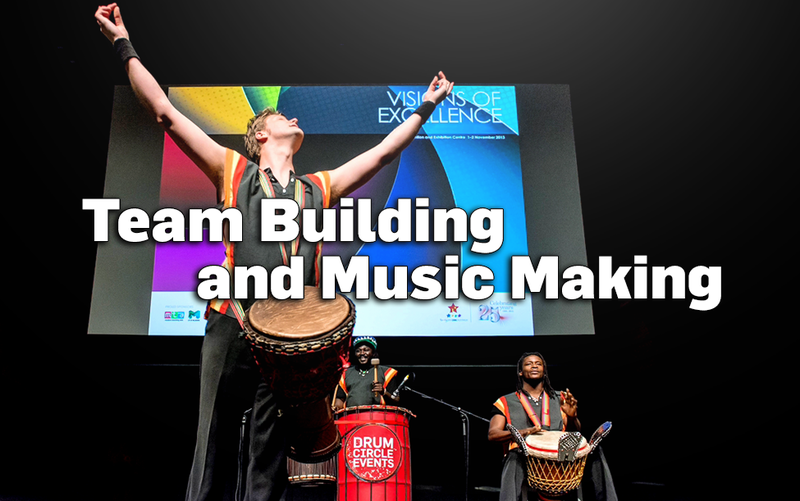 For conferences, events, team building and team bonding activities, companies around Australia and the world are drumming and working in harmony with the beat of Drum Circle Events. Interactive drumming is a cutting edge tool increasingly being used in the business environment to develop unity in the workplace. For centuries people have used drumming to release stress, raise their spirits, enhance clarity and focus, and develop a culture of co-operation and community. We illustrate that in the same way as music is structured, so too is an organization - each individual and department plays a specific role within the company for its effective and successful functioning. Communicating with each other allows music to created! Included in our team are some of the top drummers and musicians in the world that add energy to your conference, teambuilding event or team building activities, celebration or special event, incentive programme, product launch and training or leadership programs. For Corporate Entertainment, Awards Dinners and all kinds of meetings - Drum Circle Events presents energisers for company events all across Australia. Interactive music making creates unity in minutes. Quite simply, it brings people together. How? Well that’s the fun part! With an instrument for every participant, our team of professional musicians and facilitators conduct a truly memorable, interactive musical experience. No matter how big or small your event may be, we're here and ready to work with you toward it!